Median Sternotomy with dissection of the restrosternal and precardial tissue. 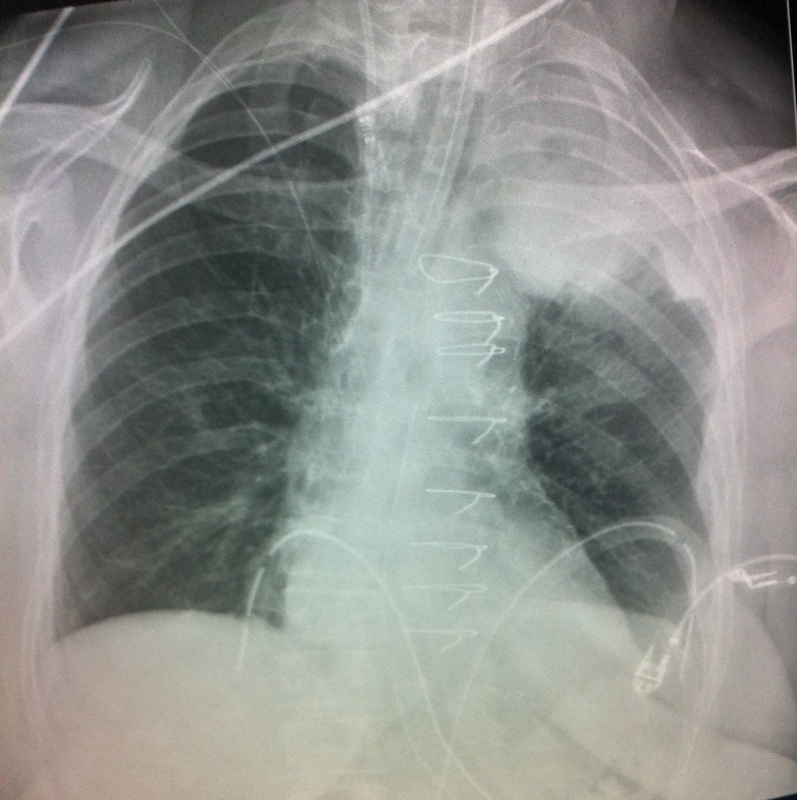 An asymmetric (IMA) sternal retractor used to elevate the hemisternum. Table should be turned away from the surgeon and elevated to the appropriate height. The pleural reflection may be dissected from the anterior chest wall. The pleural space may be opened widely from the apex near the subclavian vein to the diaphragm. It should be secured with clips to avoid excessive bleeding. Prior to dissection, IMA should be identified on the internal chest wall. 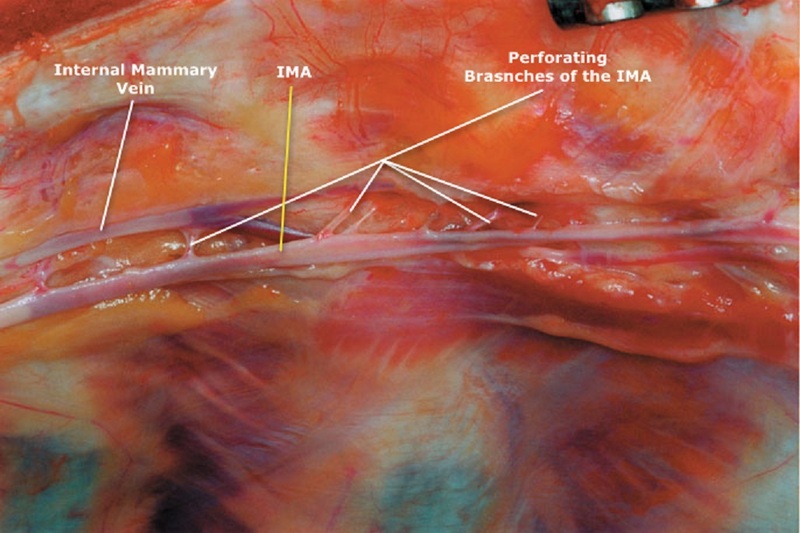 IMA runs approximately 1.5 cm lateral to the sternal edge, between two veins. Pulsation of the artery may be visualized or manually palpated. IMA may be visually identified quite well between the first rib and the third intercostal space where it runs on the parietal pleura. 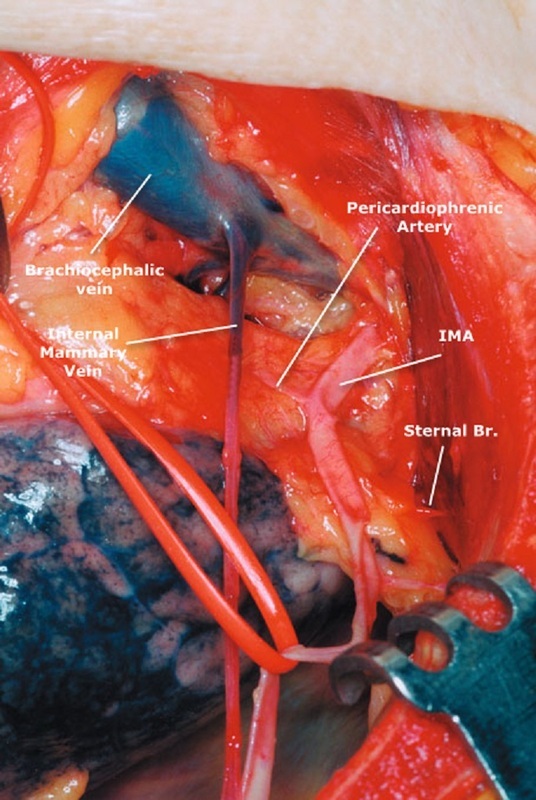 From the third rib to its bifurcation, IMA runs between the chest wall and transversus thoracis where artery and the veins cannot be visualized very well and but still can be manually palpated. 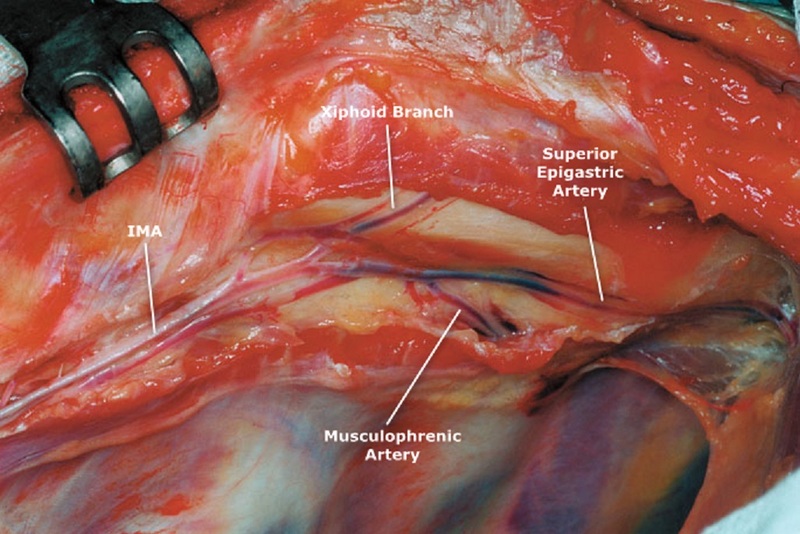 Some advocate leaving the pleura intact by simply pushing it away from the endothoracic fascia. Intraoperatively the intact pleura may retract the lung away from the operating area. This tends to displace IMA pedicle and may kink it with the inflation of the upper lobe of the lung. 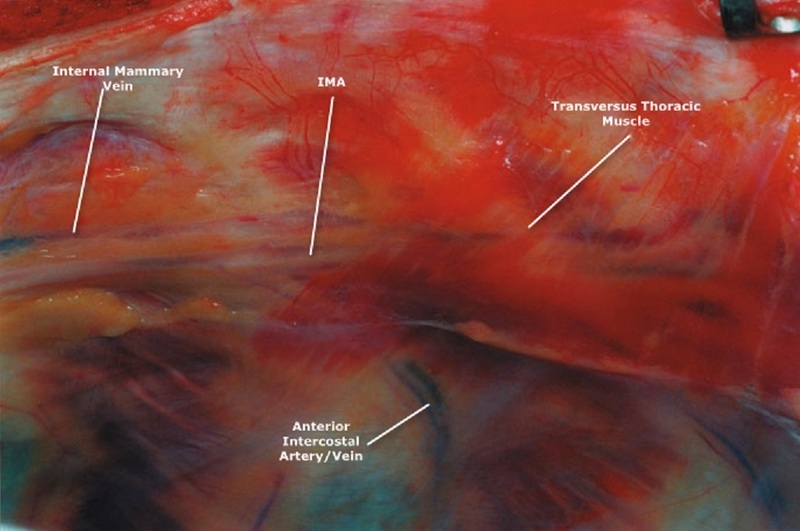 The medial aspect of the endothoracic fascia is then incised at most accessible portion of the IMA, usually at the level of the middle or inferior third. Care must be taken not to grasp the artery directly; retraction against the vein or fascia is preferable. The fascia is incised at the superior-most level of the artery near the internal thoracic vein. 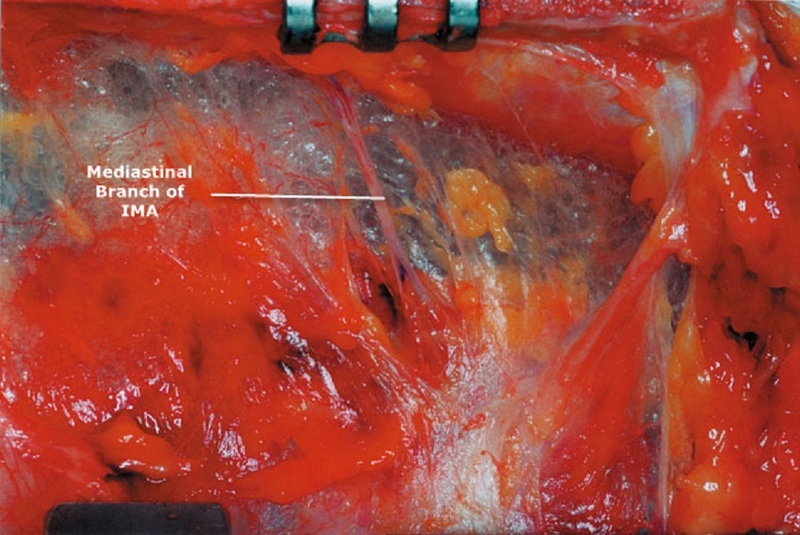 Downward traction of the fascia with the pedicle, together with cold (blunt) dissection using the electrocautery blade separates the artery from the chest wall, surrounding muscle, fascia. 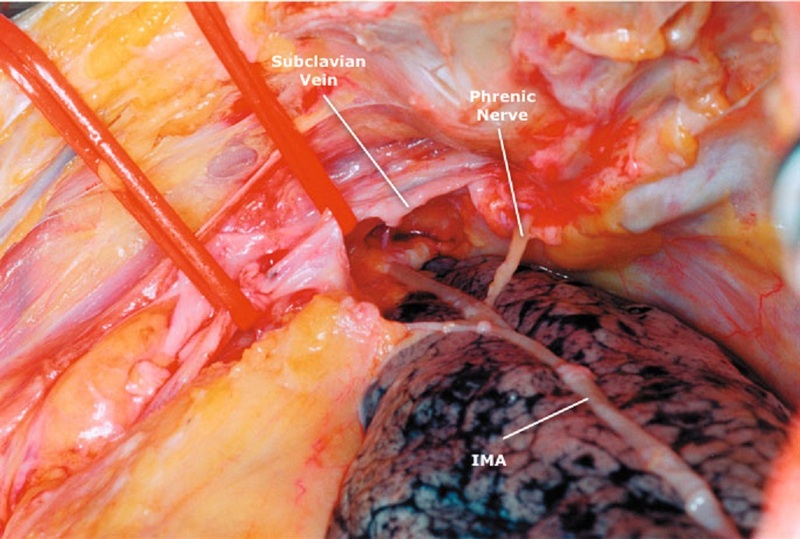 Isolate the medial aspect of IMA then progress over the superficial surface toward its lateral side securing its branches with metal clips just over the IMA. Dissection is carried out along the entire course of the artery. Permanent downward traction facilitates the distal dissection. Finally, the pedicle has been separated from the chest wall. Additional length can be obtained by opening the rectus sheath and additional length of vessel may be taken down. After an appropriate length is achieved, the distal end of the graft is secured with a clip. The dissection is carried on caudally toward the pleural cupule and is followed to its origin at the subclavian artery. 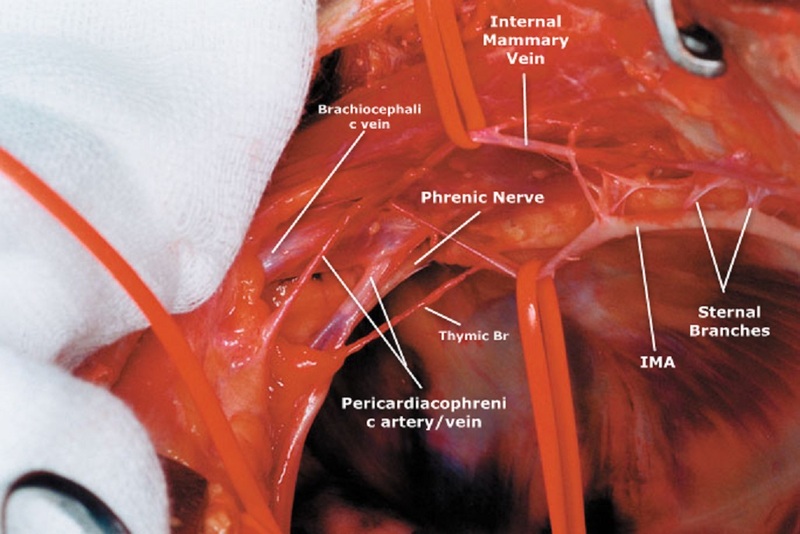 It is important to spare the pericardiacophrenic artery as it is a major blood supply to the phrenic nerve. On entering the pleural cupule by removing the fatty tissue just behind the brachiocephalic vein, the phrenic nerve comes into view.